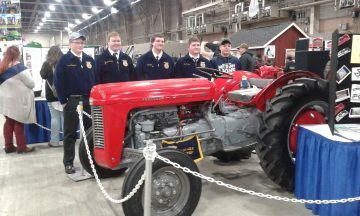 With the Pennsylvania Farm Show in the recent past, it left BEA FFA in the spotlight, as it does every year. Students competed in rabbit competitions, tractor restoration and horticulture exhibits. Other students received their FFA jackets as official members of the national organization and four students earned their Keystone degrees. Bald Eagle FFA had seven members attend the Mid-Winter FFA Convention where three of four first-year FFA members earned an FFA jacket through the State FFA Alumni Jacket Scholarship fund. These students submitted an application outlining why they should be chosen to receive the FFA jacket, and the winning recipients from Bald Eagle Area were Isaac Dechow, Clayton Liner and Hannah Trigg. Two juniors and two seniors also received their Keystone Degree – the highest award the state can give to an FFA member. Students who earned their Keystone FFA degree were Caleb Cain, Alex Holt, Kyle Spicer and Samantha Trigg. The Pennsylvania Farm Show is the state’s equivalent of a state fair. The goal of the event is to showcase Pennsylvania’s top industry, agriculture and all of its products. In total at this year’s exposition, there were 6,000 animals and 10,000 competitive exhibits. During the event, the department chairman also approached ag teacher and FFA adviser Todd Biddle to help rewrite rules to better clarify judging in the future. Biddle said he will work with students and BEA engineering teacher Kathy Gee for rules specific to the miniature landscape and horticulture exhibits. Next year’s event will be held Jan 6-13, 2020.